Finally my exams are over. Christmas vacation! I’m going out-of-town in couple of days so I’m going to put in a few recipes over the next days. Both Christmas related and not Christmas related. 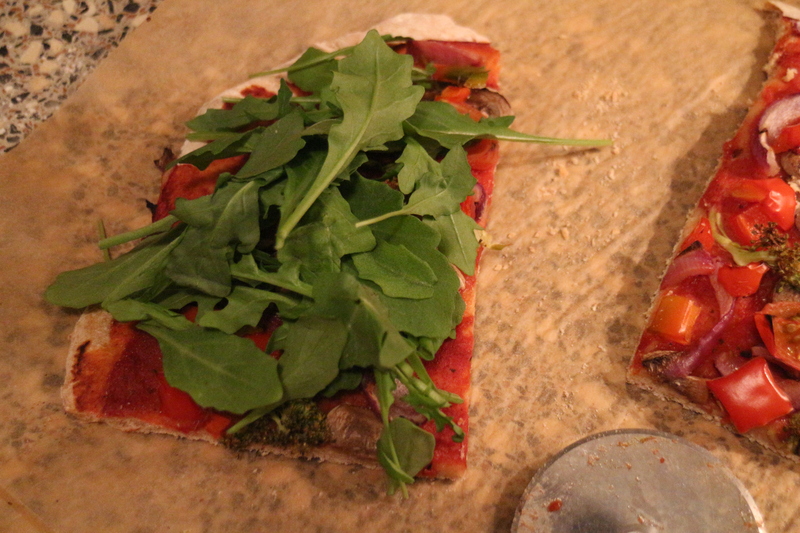 First up is the pizza recipe I promised you a couple a weeks ago. I think this recipe is so good when you feel like those thick crust pizzas you used to see in cartoons when you were little. Like Turtles and other cartoons. My boyfriend loved that show when he was a kid. I love how much you can make out of this dough. If I’m only making pizza for the four of us I make this and everyone has a thick crust pizza. But if I’m having family or friends over I can make 3 large pizza crust out of one recipe. But of course they will not be thick crusts. More like the regular ones, semi thin. First you need a rolling-pin to make a circle like crust. 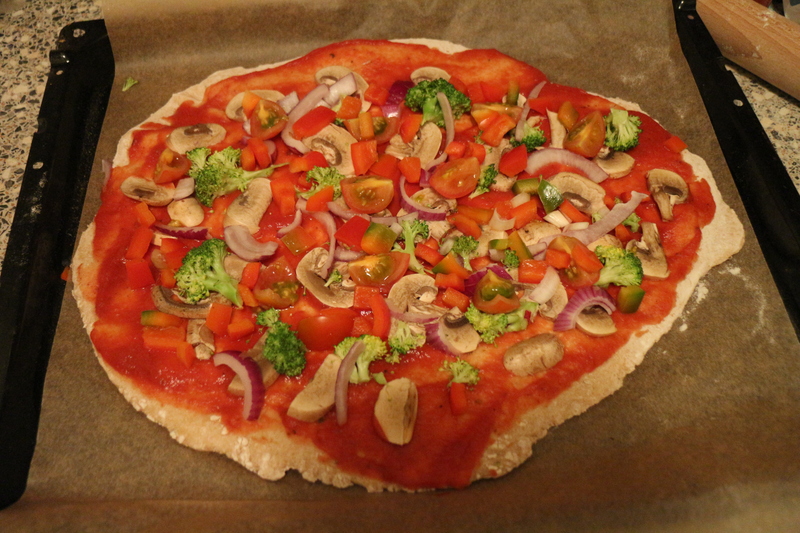 Find your favorite toppings and add them on the crust after you’ve spread everything with a nice pizza sauce. I’m not always using the same pizza sauce, I’ve made my own and I buy ready from the store most of the time. I think I was using Hunt’s pizza sauce that time. You can add non dairy cheese like Daiya cheese or Sheese cheese. But I prefer mine without the cheese. And in the oven it goes for about 15-20 minutes. Depends on your oven and how much you want it baked. 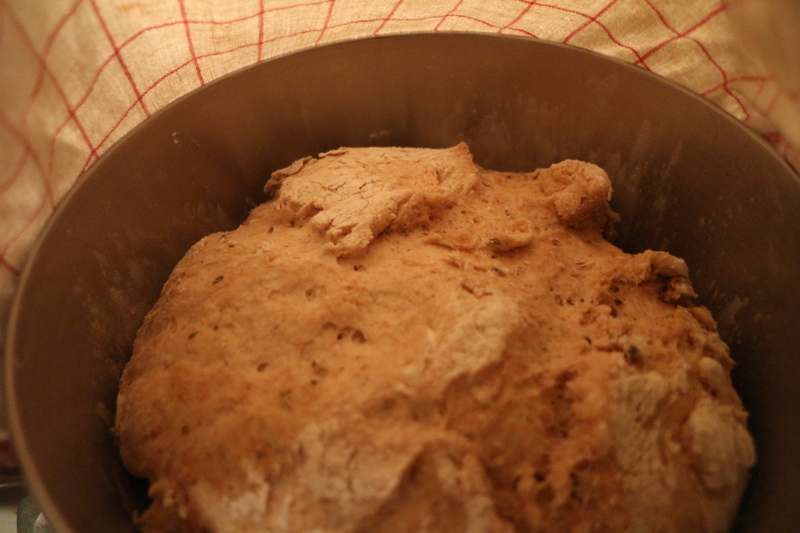 1. add yeast and water to the bowl, mix. 2. add olive oil and spices, mix. 3. add flour and knead for 5 minutes or a little less than that. 4. Let it sit for 30 min. Until double in size. This takes a little more time than some of my recipes but this one is worth the wait. 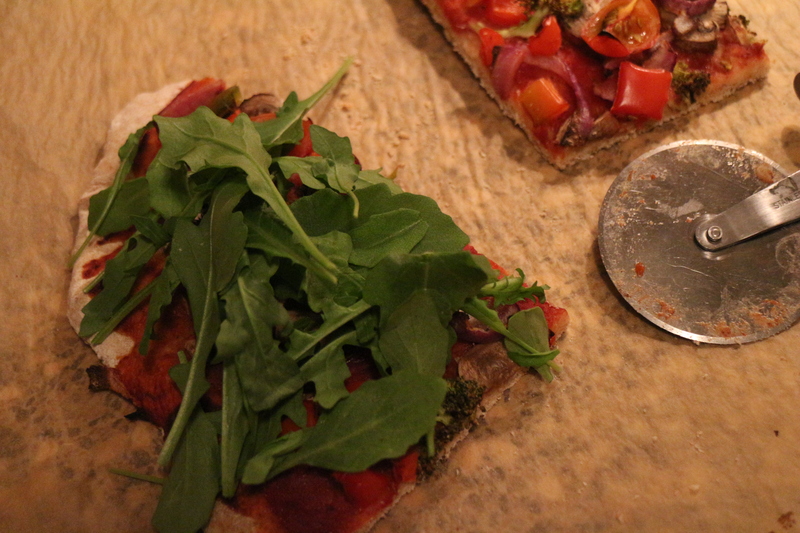 It is so much nicer to have a home-baked pizza than a take away pizza. If you like to make your own sauce. That’s easy ! Just take a tin of tomatoes you like, some oregano/basil, garlic and olive oil. Put oil and garlic on a frying pan , then add oregano/basil and tomatoes. You can then mash it up with a fork for a chunky texture or use a hand blender for smooth sauce. I never use recipes for simple things like that. Just add something together if it’s not good, it will be better the next time. I hope you try our favorite pizza.